"I've never seen anyone with a face as unlucky as yours." Originally airing from 1981 to 1986, Urusei Yatsura—which roughly translates as "Those Obnoxious Aliens"—is one of Japan's longest running and popular shows. The series is based on the 34-volume manga by Rumiko Takahashi (Maison Ikkoku, Ranma 1/2) and published in Shounen Sunday Comics over nine years. The second disc brings another collection of eight half-episodes, and introduces more new characters to the wacky cast. Of course, in the center of all the mischief is one Ataru Moroboshi, born on the unluckiest day in the Buddhist calendar, and living up to the reputation in spades. His mother calls him "the personification of the word 'stupid'" and his alien wife, Lum, reprimands his lecherous manner by delivering electric shocks, while her cousin Ten delights in heating things up by breathing fire. Lum: Shinobu! Where'd you hide my darling? Shinobu: What are you talking about? Ataru ran away from home because he couldn't stand you any more! After the mayhem that resulted in the first disc's episodes, our first installment here finds him trying to escape the situation. Only Ataru would attempt to eat ramen through the mask he's wearing as a disguise, as he tries to slip unnoticed from the watchful eye of his new alien bride, Lum. However, he has garnered a fair reputation for his misdeeds, and after a widecast announces his disappearance, his identity is soon uncovered. While on the run from an unruly mob, he literally runs into a gorgeous young woman—Ataru's mission in life—but she is complaining of heart ailments, so Ataru offers his best medical advice: "Should I take off your bra?" It turns out this young lady is Sakura, a Shinto priestess (and Cherry's niece), who decides Ataru requires an exorcism, the outcome of which is too scary! Returning to school to find all his male classmates eagerly awaiting the arrival of the new school nurse—a certified babe—Ataru is shocked to discover it's Sakura. While his friends all suddenly develop serious ailments requiring a trip to the infirmary, Ataru is acting extremely out of character avoiding the luscious nurse—something must be seriously wrong with him! With Lum around, Ataru has had a hard time getting together with his girlfriend Shinobu, who has become quite jealous of his new living arrangements. His attempts to phone her discreetly are hampered by Jariten, who informs Lum of his cheating, to which she reacts by getting on the line and infuriates Shinobu even more. When Lum gets fed up and retreats to her spaceship, Ataru figures he is in the clear, but Lum is monitoring his movements and intercepting his calls—creating an anomaly akin to the Bermuda triangle as a result. Ataru accidentally summons a demon into the house, which drives Lum from the residence; however, when he discovers the little beast has a libido even more energized than his own, Ataru has to find a way to eradicate the problem. Luckily, Cherry is on hand to exorcise the demon, and with an experienced monk in charge, hey, what could go wrong? The final half episodes cover more madness, as with Cherry's help, Ataru finds a way to do away with Lum's shocking retribution, but the solution has some interesting side effects. Then, Lum's Oni voodoo dolls cause quite a stir, especially when Mr. and Mrs. Moroboshi get in on the action. Is that an alien in your closet, or are you just happy to see me? Another new character, this time the Princess of Neptune, Oyuki, shows up in the most unexpected location. Then the gang finds themselves in the prehistoric age after a aerial race goes haywire. You never know quite what to expect from this series, and the fun is pretty much nonstop. From Ataru's incessant girl ogling to Ten's flying style, there is plenty to extract a laugh or two throughout each show. Aside from the TV episodes, there are 6 movies and 9 OVAs, all of which are making their way to DVD from AnimEigo, except the second movie, Beautiful Dreamer, which is currently available from CPM. Image Transfer Review: This is an older show, but even still, the image quality is better than expected. There are some minor source anomalies like dust and the odd shaky frame. Colors are quite strong, but do tend to bleed on occasion. Compression issues are limited to a bit of blockiness in dark blues, and a small amount of haloing. There were a couple of rainbows present, but nothing major. Considering its age, this looks great. Audio Transfer Review: Mono Japanese sounds as good as I would expect from a mid-1980 TV series. There is no brashness, and the low mids are full. A little bit of hiss, but nothing obtrusive. This isn't state-of-the-art, but does its job nicely. A sheet of liner notes gives some cultural background on the episodes, which highlights the brilliance in the writing, while a second sheet has English and romaji lyrics for the opening and end credits. 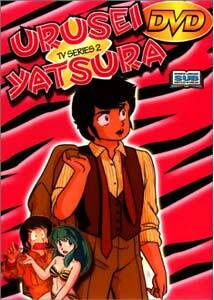 Urusei Yatsura is a twisted and extremely funny old school anime series. While the characters can be relied on for their individual quirks and traits, the situations they find themselves in are completely unpredictable. This show is one of my favorite series for its witty writing and outrageous comedy. As the closing theme says, "Lets put weird and weird together and make it even weirder!"